Earn $26.39 in Rewards credit (2639 points) What's This? 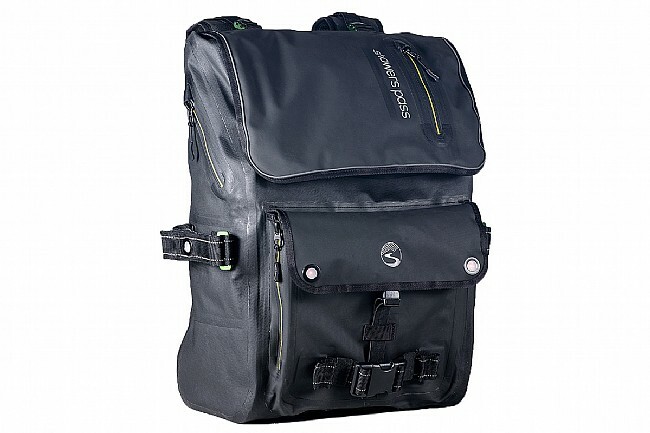 If you need to pack heavy, but it's pouring rain and you need your gear crisp and dry, the experts at Shower Pass have just the ticket with their Transit Backpack. TPU-coated 840-denier ballistic nylon with welded seams and weather-proof zippers handle the roughness of the everyday commute while providing waterproof defense against the harshest downpours. Multiple fleece-lined pockets safely manage your 17" laptop, 10" tablet, and phone, plus other internal pockets keep water bottles and other goods organized. 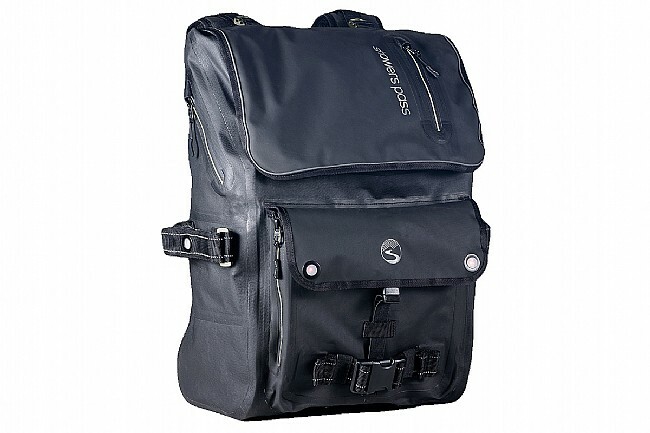 Two zippered pockets on the top-flap and side give you quick access to your essentials, and below, a stretch gusset pocket is the perfect spot for a helmet when you're off the bike. Two adjustable loops at the sides hold a U-lock or can be used to lash larger items. 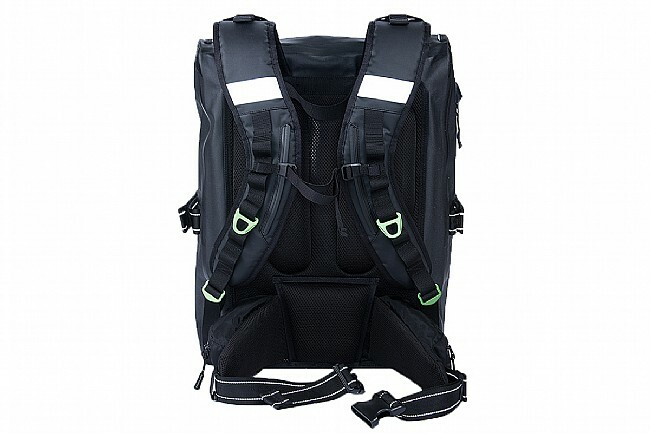 42 liters of storage space should hold even the most extensive pack-lists, and the Transit Backpack has it covered when comes to actually carrying the load comfortably with a 3D-mesh ventilated back with wide shoulder straps and a sturdy waist belt. 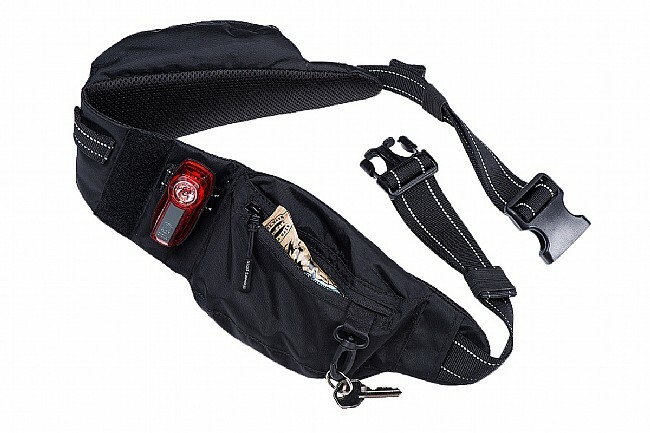 The sternum strap is removable, as is the waist belt which features two pockets of its own, making it a super comfortable and low-profile hip pack for ultralight riding. Four Showers Pass Beacon lights are integrated into grommets on the sides. Combined with 360° reflective accents, the Utility backpack is as safe as it is spacious. 42 liter storage capacity. 13.75" width x 20" height x 8" depth. Claimed weight is 4 lbs. Anodized aluminum hardware. 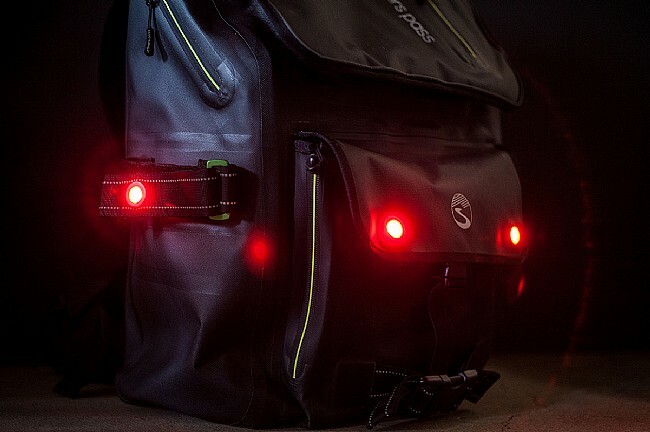 Beacon lights are powered by CR2032 batteries and have a claimed life of 200 hours in flashing mode. I use the pack every day for daily commuting, grocery shopping, etc.. The only thing I do not like is that the LED lights that come with the pack easily fall out of the metal rimmed holes if one brushes by anything. Thus, they are very easy to lose! Otherwise, a great pack!